Sorry this post is a few days late. Mainly due to my lack of emotional control when stressed. I know only week 4 and im already stressed. 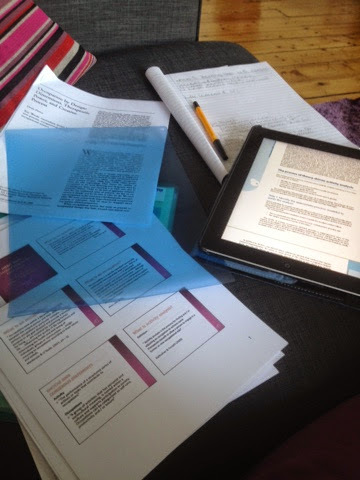 This week was taking up by a huge amount of journal reading and trying to put together my first formative assignment [for everyone not in the know... That is an assisgment that helps prepare you for the actual marked assignment] for our module on research and scholarship. It is being peer reviewed by another student on either the MSc OT or MA Social Work course. But as one tutor said confusion is good, thats how you know you are actually getting to a point of understanding something enough to go deeper... Well thats the gist of what I took from what they said. This week has also reminded me of what a support some of my friends really are to me. That even when jet-lagged they are willing to meet up for a coffee to help me to re-evaluate the situation when I feel to emotional to make realistic demands of myself. Im hoping as I go through this masters it will alow me to continue to develop my own skills in managing my emotional responses to stress.